As I promised, I’m publishing one primary article that contains overall description of the whole project and a “work log” which will be updated every time a progress is being done. This project is not finished yet , but I think that I can share it with you in its current form. 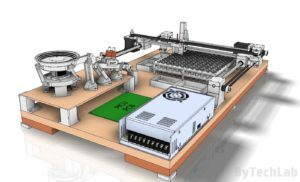 The main idea was to build a machine that would completely automatically sort some random SMD parts by their size ,shape, type, and most importantly their value and other parameters (resistance,capacitance,ESR etc.) .The whole machine may find use in searching some “perfect” parts that have to meet some requirements. But the truth is that I’m doing this project just for fun 🙂 . For example you may want to find a resistor that haves exactly 10k ohm value not more or less. Some analog stuff might need precisely chosen components. You can throw some 10k resistors into the bowl feeder and program the whole machine in such a way that it finds part value that you need (as you know resistors and other parts have some tolerances for ex. 10%). Parts that doesn’t meet your expectations will be thrown to the trash tray or somewhere else, possibilities are almost endless. You can also use this machine if you accidentally mix some SMD capacitor values together and you don’t really know which is which 😛 (as you might know they are not marked like the resistors). So, instead of measuring each one by hand you can throw them to this machine and wait for the sorting process to be accomplished. This machine will sort up to 144 different part values (that much test tubes fit into the rack/matrix). I will probably write a PC application that will allow you to program the whole thing easily via USB. 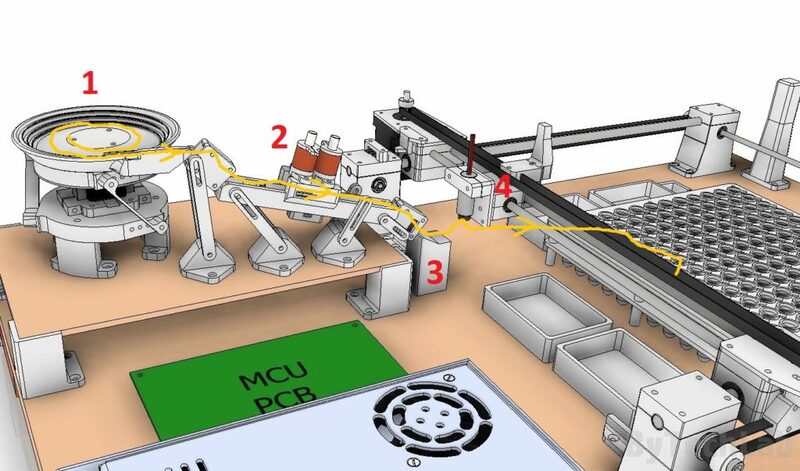 The whole X/Y axis assembly will be used for another purposes too (I will describe them below). As the title suggest it is an “experimental 2 axis platform”. As I said before ,this project is not finished yet. I will probably publish one more sub-article describing the MCU (main controller board) and the X/Y axis assembly itself. You can find all links to the sub-articles of this project down below (just to organize everything). For now I’ve written only two sub-articles, the last two should be published within the next week if everything goes well. As I said before , the whole 2 axis “platform” will be mainly used to experiment with some prototypes and other interesting stuff. I’ve even designed a fast mounting system that will allow me to swap things on the main table very quickly. Because of that I can convert the whole machine in to laser engraver just in a few minutes. 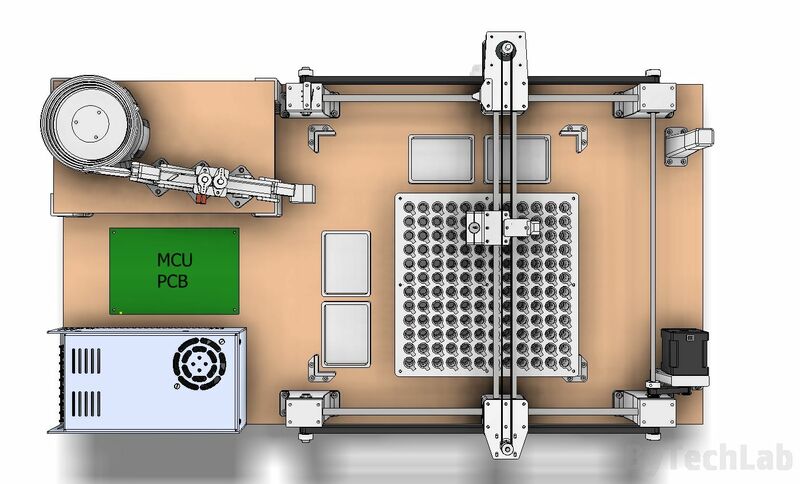 The MCU board will have many outputs and inputs (H-bridges ,relays , high current transistors, logic outputs/inputs, analog inputs etc – just everything that might be useful to drive some standard components such as coils, servos, actuators, motors etc.). The whole X/Y axis assembly is designed in the way that it is easy to implement new improvements / modifications. For example: the whole front plate with attached “accessories/heads” (for ex. laser, electromagnet etc.) can be changed almost instantly because I’ve designed a clever neodymium magnet mounting system. 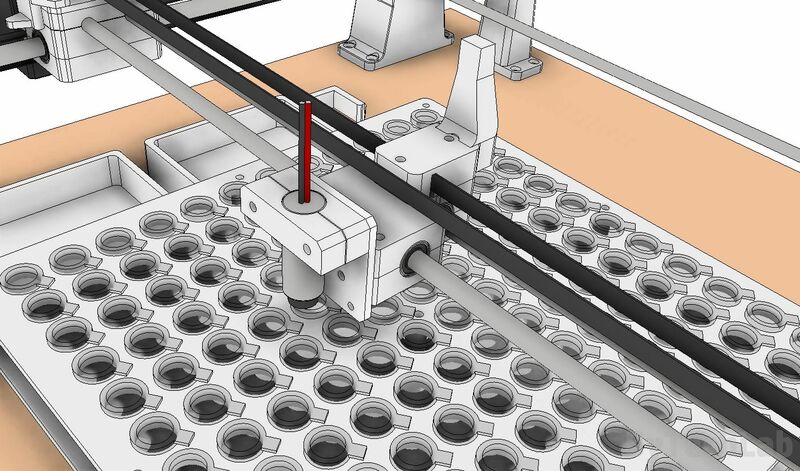 The whole manipulator was designed in the way that the “working area” can be easily adjusted to your needs (the only thing that changes are rod and belt lengths). Later I will describe everything more precisely in a separate article.